Although doctors still tend to recommend avoidance of allergens for the first line of treatment, another option to consider is immunotherapy, also called 'allergy shots.' Immunotherapy is a treatment that aims to increase your tolerance to an allergen and by doing so, decreases the allergic response. It's important to understand how your immune system works before you can understand the mechanism of immunotherapy. In an allergic person, their response to a normally inoffensive substance is that their immune system views the substance as an invader, and thus launches an attack. The body releases chemicals such as histamine and leukotrienes, which cause inflammation and the characteristic painful symptoms of hay fever, such as nasal congestion, watery eyes and throat irritation. For most people, avoiding the allergen to some degree will provide relief and where needed, medications can minimise inflammation and discomfort. If this is ineffective, immunotherapy may then be recommended. Immunotherapy tends to be recommended for those who have severe hay fever or suffer from symptoms on a regular basis, particularly year-round. It's crucial to note that immunotherapy does not cure the allergy but it does reduce a person's sensitivity to the substance and as such, reduces their allergic response. 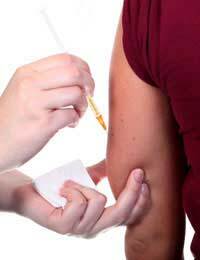 Typically, you will receive allergy shots in your arm and the doses will slowly be increased. The idea is to provide controlled but small amounts to reduce your sensitivity to the allergen. Shots are generally given on a weekly or twice weekly basis over a period of several months. Assuming immunotherapy is effective, you will likely continue with the allergy shots on a biweekly or monthly basis for several years. If effective, you will notice that your hay fever symptoms improve and you may even stop experiencing them completely. You should be thorough when telling your doctor about any medications you are taking because some medications can interfere with the success of immunotherapy. Medications may also result in uncomfortable side effects from the treatment. Prior to receiving immunotherapy, there are some basic guidelines to ensure you obtain the maximum effectiveness from the treatment and minimise any discomfort. It's usually recommended that you avoid any intense exercise, particularly cardiovascular types of exercise, because the increased blood flow encourages a more rapid immune response to the allergy shot. After you receive immunotherapy, your doctor will likely monitor you for any side effects, which may be similar to the symptoms you experience from hay fever. It's considered common to experience inflammation at the site of the injection and this should subside soon after receiving the shot. Immunotherapy can be delivered in various formats and your doctor will decide which one is appropriate for your symptoms. Rush immunotherapy entails a faster progression of increased doses, rather than the slow build-up of exposure, which is often performed. The allergy shots may be given at intervals of several hours, rather than once or twice a week. Unfortunately, the risk of side effects is higher and monitoring by a doctor becomes more important if this type of immunotherapy is administered. Another option is oral immunotherapy, where drops are placed under your tongue and swallowed instead of allergy shots. This specific form of immunotherapy is limited in availability, depending on your geographic location, but it may provide relief provided you can receive this format. Another form of immunotherapy is nasal, where the allergen is administered via the nose. This is also limited in availability and depends on your geographic location, as not all countries have approved this format of immunotherapy. It can cause temporary nasal irritation but has shown success in treating the nasal symptoms of hay fever. There are many treatment options for hay fever and your treatment will likely being with avoidance of the allergen, followed by medications as needed. If your symptoms are severe, immunotherapy may be recommended for treatment. Hay fever can wreck havoc on your ability to function at work, school or in your personal life but fortunately, treatments such as immunotherapy can provide much needed and deserved relief for hay fever sufferers.